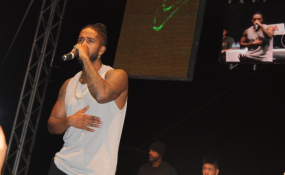 Windhoek — What promised to be one of the biggest concerts on this year's local entertainment calendar, headlined by acclaimed American RnB singer, Omarion, turned out to be a poorly attended event with only about 200 people pitching. Despite this setback the artistes did their best to save the show and turned the entire event into a 'not to be missed'. Some revelers said it was supposed to draw a huge crowd since Omarion is one of the most loved singers worldwide, and blamed it on organisers for not marketing the event properly. Alina Mbango, a big Omarion fan, said although many people did not show up, it was the music extravaganza of the year. "It was on fire and I enjoyed it from the beginning to the end ... this was the best show ever in Namibia so far this year," said Mbango, adding that all the performances were excellent. Lukas Tomas said the poor organization created a bad image for Namibia but he was happy the show took place despite the setbacks. Dr Loneson Mondo, who organized the event, was not available for comment. The show was scheduled to start at three o'clock in the afternoon but only began at nine o'clock in the evening, with about fifty people in attendance. Maranatha opened up the night with her amazing performances, with songs from her debut album Smile. Tate Buti was the highlight among local artistes, performing songs from his old and new albums. Swartbaster also did not disappoint, as he turned the event into a dance show. Songbird Freeda did what she does best by performing her new songs in style and with her dancers lit up the scene as well. Young T who was supposed to perform did not turn up for unknown reasons. Omarion wound up the event by performing for about forty-five minutes, with people craving for more. Some of the songs the artiste did were 'I am saying', 'Know you better', 'Touch', before closing the show with the hit song 'Distance'. Copyright © 2017 New Era. All rights reserved. Distributed by AllAfrica Global Media (allAfrica.com). To contact the copyright holder directly for corrections — or for permission to republish or make other authorized use of this material, click here.